I want our new center to be that place. We call DigLibArts a collaboratory where we encourage and support our campus community in their use of digital technologies to enhance teaching and learning. 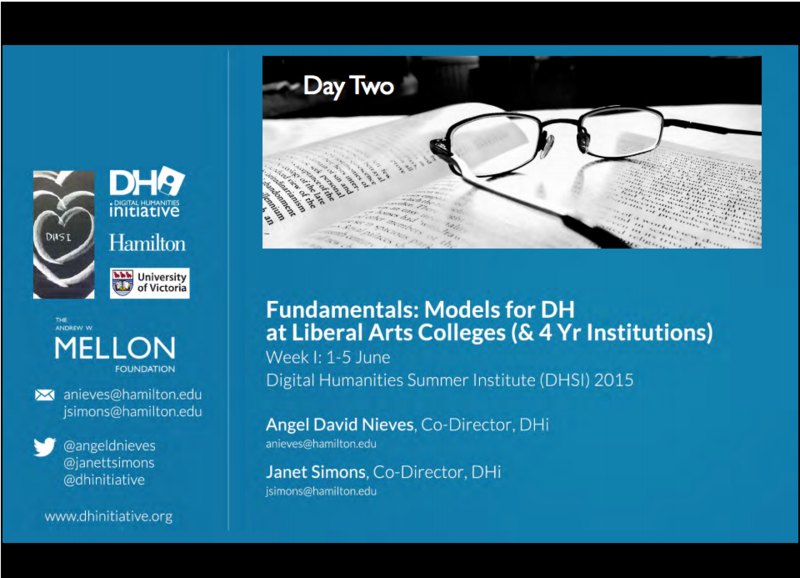 In the spirit of discovery, this past week I participated in the course “Models for DH at Liberal Arts Colleges (& 4 Year Institutions) held at the Digital Humanities Summer Institute (DHSI). The goal for participants was to define what the digital humanities means at each of our institutions and to to build on a model that best reflects each of our campus’ ethos. What do digital humanists do? Practitioners of DH are builders. Some use coding to create interactive websites or maps. Others use computer programs to transform analog to digital; there is text encoding, data visualization, topic modeling. There’s geographic information systems (GIS) and other lingo like OCR, TEI, XSLT, LAMP—OMG! 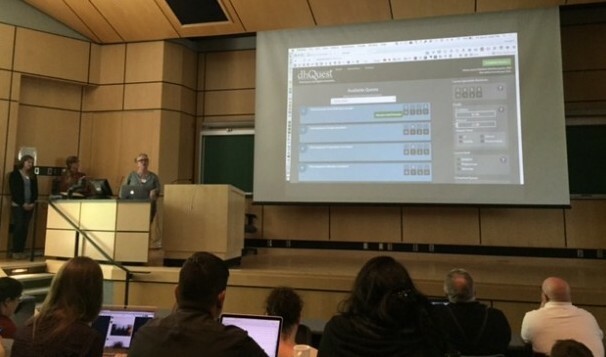 What I’ve found is that DH is not all about using tools; it’s about finding new ways to ask —and answer research questions using technologies and methodologies to aid in discovery. It’s an opportunity to involve students in research that asks critical questions about media studies. It’s about the why, who, when and where of digital pedagogy. It’s about building networks to support digital scholarship. What is needed to start a digital humanities program? Do we call it a center? Do we need physical or virtual space? What about grant writing? Should we focus on research or pedagogy? These were all recurring questions during the five days of our workshop. 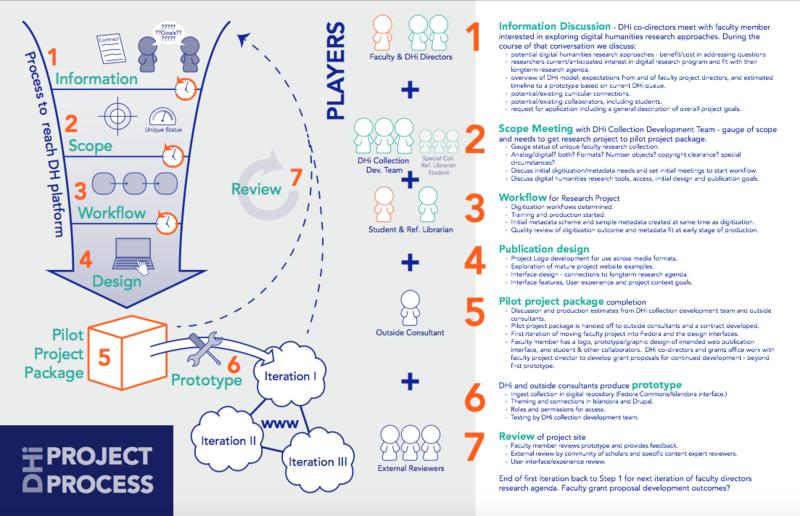 Our facilitators at DHi provided a project process flowchart that illustrates their steps in reaching a DH platform. This is based on a collaborative model that they use at Hamilton College. 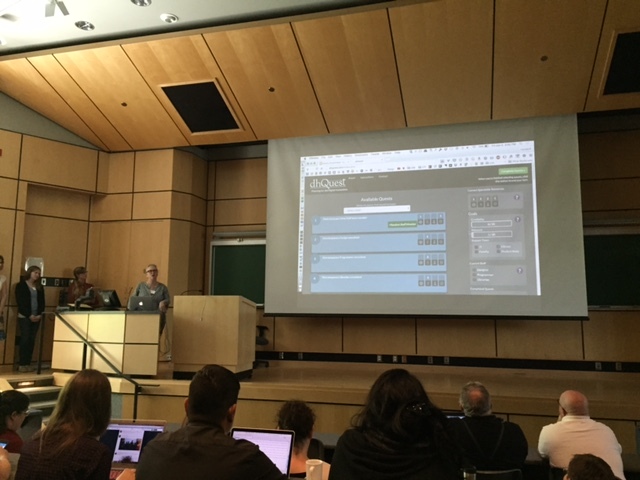 To better understand the many layers of planning for the digital humanities, our instructors debuted a game that they were working on. Enter dhQuest! Modeled after D&D (I’m told), our class played a game with challenging quests that included finding time, funding, staffing power, institutional support, credibility, and networks. We couldn’t win the game unless we had a bank with all of these resources. It’s a fun game that increased my understanding but the real-life tasks are daunting! The digital humanities is a dynamic field in higher education. Over the last couple of years I’ve been racing to catch up–or to even try to wrap my head around it. 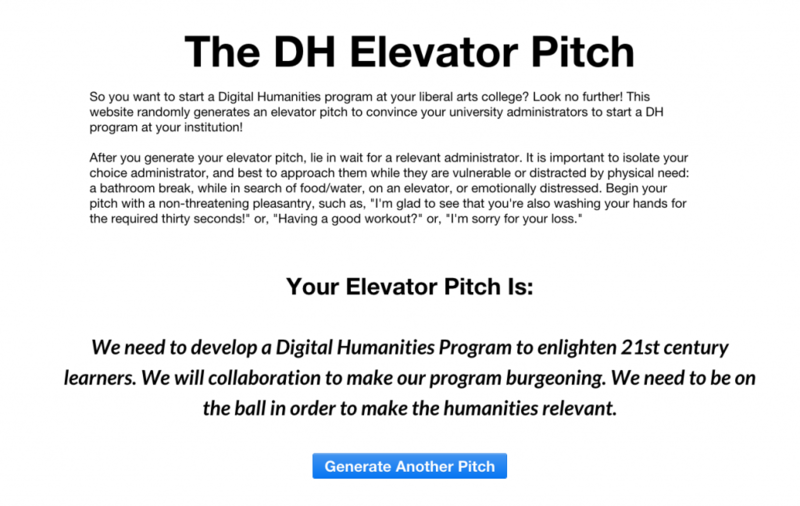 What does the digital humanities look like at a small liberal arts college? What should it look like at Whittier? How do we capture the visible evidence of invisible learning? I see now that I’ve been surrounded by answers. It’s about faculty-student collaboration on research projects. It’s about teaming up with community-based partners to design assignments that will increase knowledge. It’s about engaging students in digital scholarship and asking them to think critically about their roles as global citizens. It’s about opening up opportunities for faculty and students to use tech-fueled practice to explore traditional modes of scholarship. It’s what DigLibArts is doing and is trying to do better. It’s a model that we are shaping, steering, and now sharing with a growing number of networks who seek similar goals. Sonia Chaidez is the Instructional Media Designer and Co-Coordinator of Whittier’s Digital Liberal Arts Center (DigLibArts); a collaborative initiative to enhance the liberal arts at Whittier College by empowering faculty, staff, librarians, and students to make full and better use of the digital technologies that are reshaping pedagogical approaches and transforming research throughout the liberal arts.